9. Write out a budget before you go. I know, I am a fun sucker, but it has to be done. Know how much money you have and where you plan to spend it. Give the kids an allowance for souvenirs. They will be more careful with money they consider their own, and they will not be constantly asking for things. “Can I have that?” can be answered with “Sure, it’s your money. But are you positive that is where you want to spend it? There might be something better later…” Also, knowing how much you yourself have to spend will save you stress and regret later. 8. Keep to healthy foods most of the time. (Here I go, sucking out the fun again!) Kids will have more energy, feel better and have a better attitude if they are nourished. And it’s cheaper. Have a basket of fruit available, some whole grain crackers, cheese, peanut butter, popcorn – food with nutrients. Don’t waste valuable vacation time sitting in the drive thru line and arguing over food. 7. Keep to established routines when you can. Bring along a book for that bedtime story, keep bed time the same, set aside time for their bath. Kids don’t always deal well with change, and vacations are all about change. A few familiar routines will help them feel less stressed. And a full night’s sleep is an absolute necessity if you don’t want an emotional wreck for a kid. 6. Keep an eye on the little ones. You are in a different environment with new dangers. Distractions abound. Kids on vacation get lost, or get into Grandma’s meds or the local pool. Check out my summer safety tips. 5. Find interesting things to keep their brains busy. Bored kids whine, and then they find their own version of interesting things. Have a stock of books, games and videos for the car. Bring a journal for them to write in, and art supplies. Explore the area you travel to – Google it before you go. See the sights, hit the museums, find the local artists and craftsmen. Check out ideas to abolish summer boredom. 4. Keep your own mind open to new and different ways of doing things, so that your kids will do the same. Kids internalize their parent’s judgments, and they will close down their minds and wipe possibilities out of their lives if that is the example you set. 3. Keep them physically active as well. A tired kid is less stressed, sleeps better, and is not sitting around thinking of ways to get into trouble. 2. Keep stress to a minimum. Use a GPS if you’re driving: arguments with the navigator have ruined many a vacation. Keep your expectations in line with the actual possibilities, to avoid disapointment. Don’t overschedule – leave time for that relaxing hike and to have a conversation over dinner. Stay within your budget – your hindbrain will know you are overspending and your stress will mount. Stressed out people snap at each other and cannot enjoy time or family. 1. Align your vacation with your priorities, then toss out the rest. What are the goals of this vacation? Relaxation, family time, memories, enrichment, joy? Plan the vacation and activities that will get you there, and don’t let exhaustion, stress, and fear get in your way. Don’t stop at Uncle Joe’s house if you know he will stress you out; don’t vacation with those friends who overspend or forget to pay their half of the bill. Don’t worry if the kids are getting dirty or if your Aunt Judy wouldn’t approve. Just say no, open up, and relax. And have a fantastic vacation! Media addiction in children and the importance of limiting their screen time is a big topic in pediatrics this week. The American Academy of Pediatrics has always recommended no more than two hours of screen time per day for children over 2 (none for those under 2), and they have lots of data to back that up. Adding to this was a recent study suggesting that toddlers who watched more TV than average were more likely to be bullied later in life: reported bullying went up 11% for each additional hour of TV viewing, over the average of 1 1/2 hours. Scary. Time spent watching TV is not spent developing social and verbal skills, and not spent using and exercising young bodies. Children sitting in front of a screen develop a disabling habit of being more passive in their interactions with others. They put on weight because while they are sitting, with their metabolic rate near what it is when they sleep, they are frequently munching on snack food. They are more likely to have attention problems because TV teaches them to experience the world in 5 minute pieces. Last, their perceptions are significantly skewed because they take the behavior of characters and people on TV as normal. Which they are not. It seems reasonable that since I am one of those pediatricians constantly nagging people to turn off their screens, I have a responsibility to come up with some activities they can do instead. All those hours to fill, and all those useful skills to learn! Our children need the abilities that excessive TV viewing destroys: social knowledge and the ability to interact with actual humans, verbal skills, an attention span adequate to complete a project, and physical exercise. Let’s throw in knowledge of the real world too, just to be complete. Read a book. I know, it’s obvious, but that doesn’t make it any less important. The most rapid development in the brain’s language and learning centers occurs between 6 months and 3 years of age; we need to take advantage. Just 15 minutes of being read to each day between 6 months and 5 years adds up to 500 hours of reading before they even enter kindergarden, boosting development in these areas. Daily reading in older kids improves their comprehension and speed, in addition to adding to their store of knowledge. Hit that library! Experiment with science. My all time favorite science site is at Roots of Action. They have experiments in all kinds of science, organized by children’s age and type of science, from astronomy to zoology. There is enough there to keep your kids busy all summer long. Be creative. Break out the crayons or paints and draw. Make music. Write a story. Perform a theatrical: what kid doesn’t love performing in front of their most supportive audience? Creation exercises and stimulates the brain, making it more imaginative and receptive to new ideas. Garden. 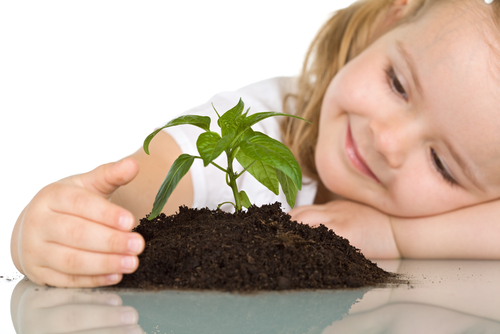 Not only does your munchkin get to play in water, dig in dirt and make a mess, but he or she will also have the pleasure of seeing their plants grow and flower. There is self confidence to be grown along with those beans for diner, and those flowers for the kitchen table. Also, they learn a little responsibility along the way, because they won’t want their precious plants to wither and wilt. Have a cooking class. Again, you get pride of accomplishment (they peeled those carrots!). They will eat better, because they won’t want their own hard work to go to waste, and they will learn an undeniably necessary skill. Make a chore list. Exercise, a sense of accomplishment, and lessons on responsibility all wrapped up in one. Give an allowance for completed chores and you can have financial lessons as well. Play a sport. With them please and have fun, so you have family time and everybody gets some exercise. Volunteer. Aiding others in need will help them appreciate what they have, and will feed their souls. The right sort of volunteer activity can also teach useful skills: Literacy promotion (reading), working with the elderly (communication, patience), hospital work (medical knowledge), food banks and kitchens (cooking and nutrition), and Habitat (building and repair) are all enriching. After all this activity, take a backyard vacation. Put out the blow up pool and some beach towels, and drink things with tiny umbrellas. Have a trail hike through the neighborhood with a campout at the end. Have a day in Paris, with a home made Eiffel Tower and a French dictionary. Go to a Broadway show produced by your favorite tiny actors. Backyard vacations are limited only by your imagination, never your wallet. Who has time for a screen? There is just too much to do! Turn that box off and put away that phone!